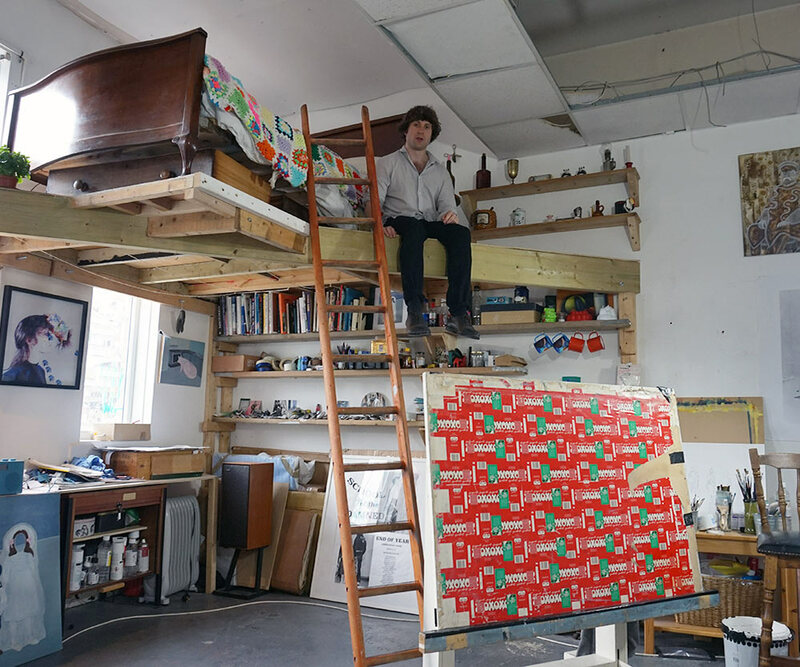 Phillip uses painting, performance, installation and film to create characters and motifs based around fictional narratives that he has been exploring for many years. 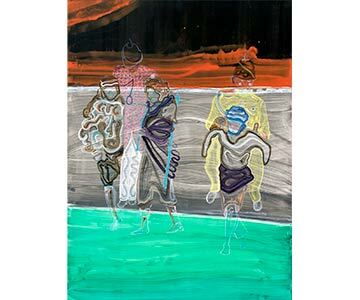 Some of his more recent works include what he loosely describes as costume design - using oil paint applied to dressmaker's paper, he has produced a series of life size paper cutout painting/clothing combinations, removed from the confines of the painted canvas, creating a surreal yet body-related presence and connection to a fiction and reality beyond our own. 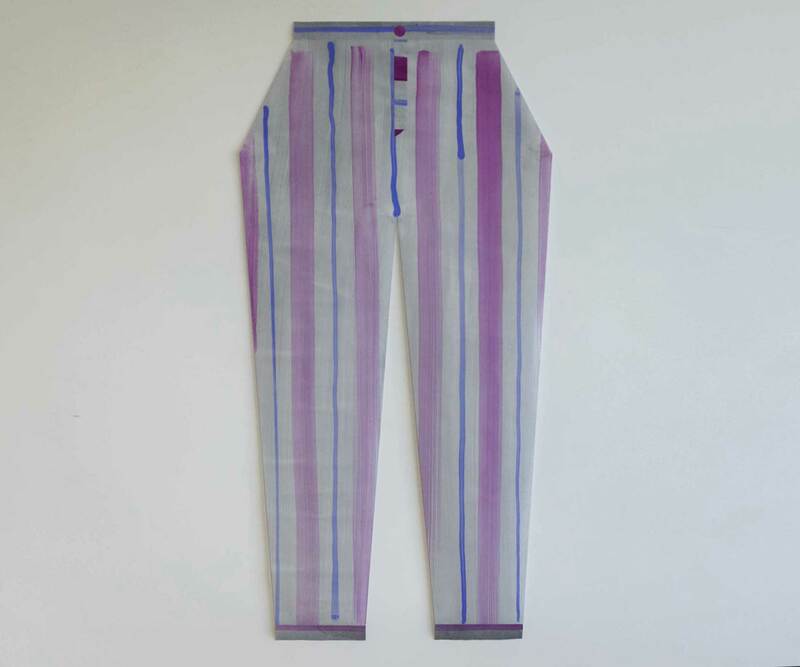 A hand-painted, hand-cut paper pair of trousers, part of Phillip Reeves' Paper Clothes series. 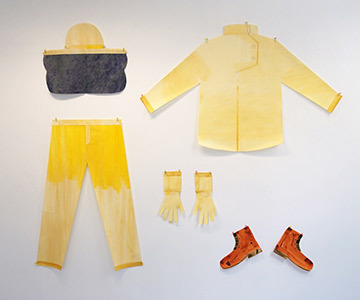 A life sized, hand cut, hand painted jumper, part of Phillip Reeves' Paper Clothes series. 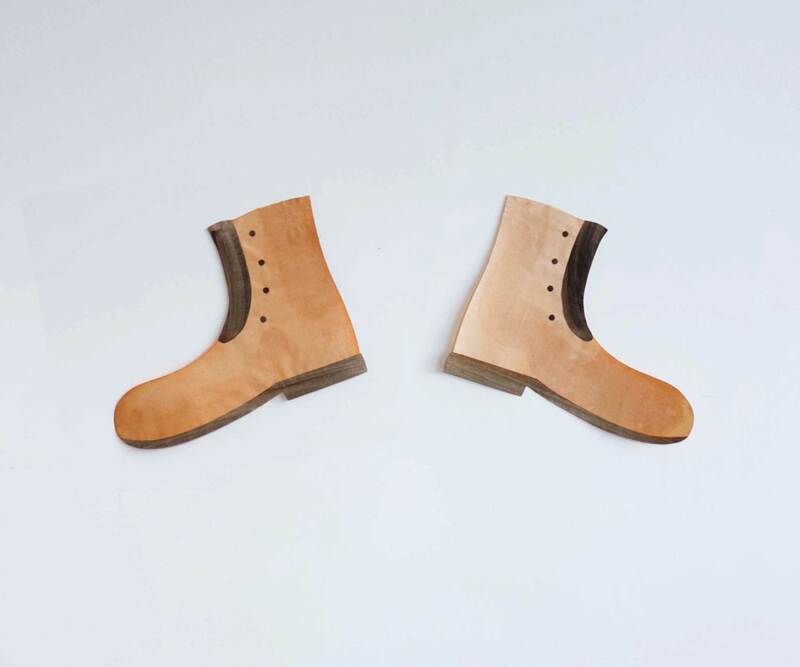 A hand-painted, hand-cut pair of paper boots, part of Phillip Reeves' Paper Clothes series. 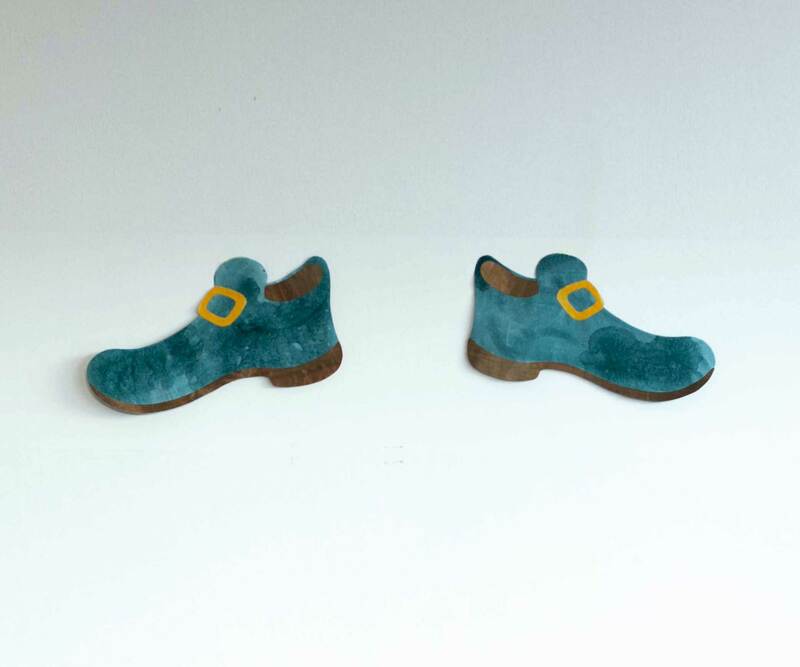 A hand painted, hand cut pair of shoes, part of Phillip Reeves' Paper Clothes series. Noh masks have been a constant in Phillip Reeve's work for many years. 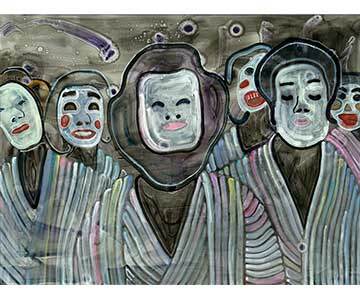 This piece is based upon a parade of characters in seen the street by the artist. Philip has used these characters repeatedly in different settings, imagining them performing a time travelling soap opera that he creates sets for, ready for them to act scenes out in. The imagary in this work involves uniforms and hierarchies, pomp and ceremony. Here we see the brave and strong captains of the army, being piggy backed to shore by servants, like spoiled kittens avoiding a puddle. 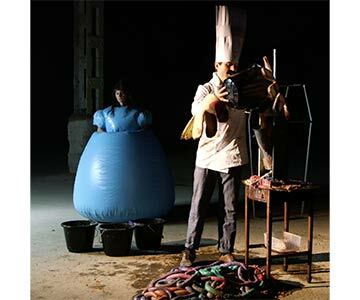 This film was spawned from Phillip's performance piece, Sausages. Rather than make a simple document of the performance, he decided to embellish it wiht an added narrative: As the spoils of war are unceremoniously dumped upon the factory floor, the mysterious appearance of a young woman in a blue dress adds intrigue to the finale, as the dirt laden air thickens the vacuous atmosphere that surrounds this culinary art noir spectacle. 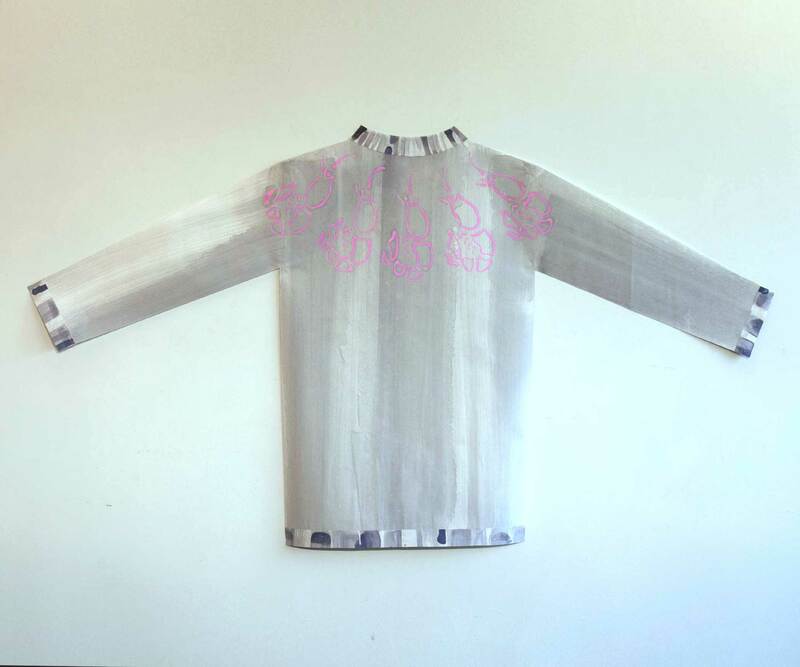 A hand-painted, hand-cut paper kimono, part of Phillip Reeves' Paper Clothes series. Each piece in this series is comprised of individual paper components, hand cut from dressmaker's paper and hand painted in oil paint by the artist. The Paella motif comes from a personal story of the artist, where he made a restaurant quality paella using only basic utensils, completely astounding his guests. 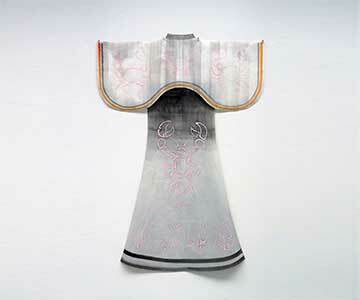 A hand-painted, hand-cut paper kimono, part of Phillip Reeves' Paper Clothes series. Each piece in this series is comprised of individual paper components, hand cut from dressmaker's paper and hand painted in oil paint by the artist. The character of The Beekeeper is a frequent reoccurrence in Phillip Reeve's work. Here, he removes the person inside the costume and presents the basic items needed to create a Beekeeper.